Kitchissippi residents likely need no reminding of the disruption that comes with infill. It is transforming our streets, and the daily reality of two, three, sometimes four infills going in at a time on some of our streets is exhausting. Contractors don’t make proper use of the washroom facilities. I know that residents could probably add to that list. At the end of this post, I’ll actually ask you to do just that. 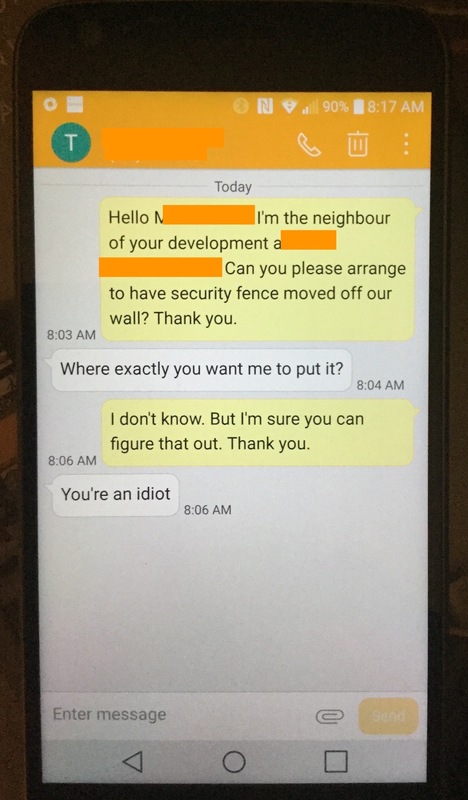 Recently, a Champlain Park resident, just trying to get through the infill going in next to them, had an exchange with a builder to ask him to move, as previously agreed, the security fence off their property. The exchange - see the inset picture - by text is a follow-up to a voicemail left by the resident with the builder that was never answered. The exchange is beyond disrespectful, and I think crosses the line into abusiveness. I’ve had a conversation with the planning consultant to this builder expressing in no uncertain terms the absolute unacceptability of treating neighbours like this. Staff in my office have been subject to similar abuse over the phone when advocating for neighbours. Infill is a reality in the ward. We’re not going to stop it. But, based on the activity at the Committee of Adjustment, we have years of infill intensification ahead of us. It’s not too late to hit re-set on the relationship between builders and neighbours. One of the greatest frustrations I have as the one looked to most often to sort out disagreements between builders and neighbours is how few tools Councillors and even the City have to deal with the litany of complaints that we hear. Parking, noise, and property standards by-laws can be enforced by the City, but the process is slow, there’s too few resources on the ground, and enforcement is ultimately up to the courts which means the City takes a graduated enforcement approach. The courts are also the only recourse for neighbours whose property has been damaged by builders. This is an immense frustration. Telling residents to lawyer up when disputes arise over property lines or damage is not why anyone runs for office. There needs to be a better mechanism to deal with infill issues. Too many problems are dealt with by too many levels of government and agencies. Property damage? Go to court. Unsafe workplace practices? Call the Ministry of Labour. Noise, parking and property standards complaints? Call 3-1-1. Trespass and harassment? Call the police. Unsound environmental practices? Call the Ministry of the Environment and Climate Change at the Province. It’s too many silos. Residents of Kitchissippi are largely resigned to infill. Most of us grit our teeth, accommodate as best we can the builders, try to establish clear lines of communication and hope that we’ll be treated with respect. But when things go wrong, we need better tools to deal with that. Starting today, I’m calling on builders and their advocacy group the Greater Ottawa Home Builders Association to put an end to the needlessly thoughtless and disrespectful behaviour that all too often characterizes infill projects. We need an alternative to the courts. We need a body that can sanction bad builders, and recognize good. We need to give residents new agency and a voice in how infill construction affects their quality of life. Responsibility for that cannot fall entirely to the taxpayer. To that end, I am calling on GOHBA to work with me and any other willing stakeholders including the City and community associations to establish an industry-funded ombudsperson to whom residents and others can go when things turn bad on a project. That ombudsperson should have meaningful sanctioning powers and access to real alternative dispute mechanisms. Builders who agree to abide by those decisions should be identified with a trust seal, and there should be real dollars spent by GOHBA to help residents know who those are – and aren’t. Why do we need this? I’m asking you to tell me, in your own words, about the experience of infill construction that you’ve had. I’ll publish your comments. Have an infill builder you want to celebrate? Tell me! Have a horror story to share? Tell me! Send me a note at jeff.leiper@ottawa.ca. Thanks for reading, and I'll update on the progress of this effort as I can.